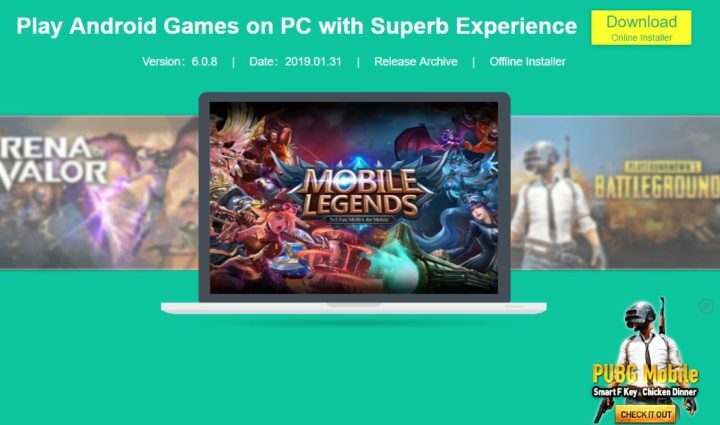 Have you ever thought of playing Android games on Windows 10/7 PC or MAC? Yes, you heard it right. 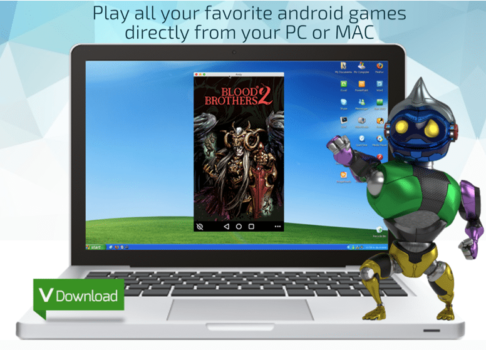 Not only Android games, but you can also use any android application on Windows PC using Android Emulators. It helps you to use the same Android apps on your big screens. Some applications look excellent in your mobile and using them on the PC will be more impressive and those same Apps will give you an incredible experience. There are many more such reasons to use Android Emulators on Windows 8/7/10 PCs or Mac Devices. If you are an Android developer, then you can use Android Emulators to test your application and know how it works. There are many such valid reasons to use Android Emulators, and if you are also looking for Android Emulators for Windows 7/10 PCs or Mac Laptops, then you have landed on the right page. Note: Most of the Android Emulators would drain up your CPU, So I recommend not using any other software while running Emulators. This way, you will not run into any issues. Here are some of the frequently asked questions about Android Emulators. Which is the Best Emulator for Android For PC? 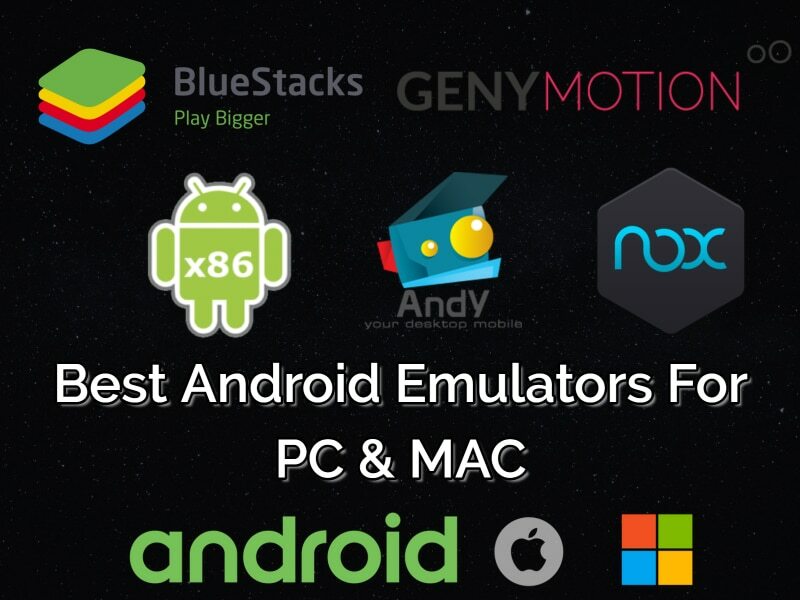 It is hard to pick one out of so many but I would say Bluestacks App Player and NOX App Player are the best Android Emulators for Windows & MAC. Which is the Fastest Android Emulator For Windows 10/7/8 PC? After recent updates, Without a doubt, Bluestacks 4 is the fastest Android Emulator. Yes, Android emulators are legal. After hours of research, I’ve listed down the best Android Emulators for Windows 10/7/8 and Mac. So, here we go! Nox App Player Android Emulator is perfect for gamers. If you want to play Android games on Windows 8/8.1/10 PC, then you can use Nox App Player. You can control and play games with mouse and keyboard. Due to its speed, many use it to test their Android games. It has a lot of many interesting features like one click to hide or show root. It has keyboard mapping, where you can use a keyboard if you want to click on anywhere while playing games. Available for both Windows & MAC. Nox Player has built-in GPS controller settings, through which you can play GPS based games like Pokemon on Nox Player in Windows OS. BlueStacks Android Emulator is one of the best one to use to access android applications on Windows 8/8.1/10 PC. It is effortless to use and should follow simple steps to install BlueStacks on Windows PC. It does not require any virtualization, and it is easy to install and play android games on Windows PC using BlueStacks Android Emulator. Price: Free or $2 per month for premium features. 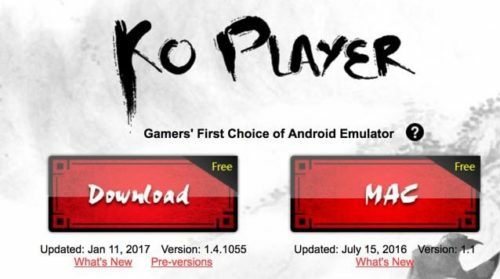 KoPlayer is another best android emulator in this list, and it is best in playing android game on Windows 10 Laptop. It has a lot of features which make KoPlayer unique from other Android emulators. You can record the emulator screen while playing games so that you can record the shared video of your gameplay. You can also use multiple accounts simultaneously. Android Andy OS is another unique and best Android Emulator for Windows 8.1/10 PC. It stands unique when compared to other android emulators due to its unique features. It allows you to use your phone as a remote control to play games. Using your desktop browser, you can install apps directly in Android Andy OS Emulator. It requires Virtual Box to be installed on your system. Droid4X is said to be one of the fastest android emulators in the list. It has some exciting features, and it needs to be tried once. It comes with Play Store pre-installed in it, and it allows you to configure your keyboard as a controller while playing games. It is fast and does not lag any of your game, and it is a good choice. Windroy is said to be one of the best Android Emulators for Windows 8/8.1/10 PC as it runs on the Windows Kernel. It does not require any Virtual Box support the same as BlueStacks. It is handy and easy to use. You need to make sure the path you install Windroy should not have spaces. GenyMotion android emulator for Windows 8/8.1/10 PC has salient features like OpenGL and support for hardware acceleration. 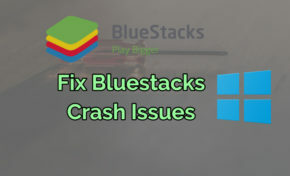 It is a bit different form of BlueStacks due to its unique features. It is faster when compared to BlueStacks as it is built on X89 architecture. AMIDuos is the new android emulator for Windows 8.1/10 PC and is perfect for gamers. It is straightforward to install and has a good user interface. It is said to be the smooth android emulator and has things like gaming and productivity well. It is not said to be developer friendly as it does not have device-specific configurations, but on the user side, it is perfect to use android apps on Windows PC. MEmu is another upcoming android emulator for Windows & Mac. The latest version supports android Lollipop and it is compatible with AMD and Intel Chipsets. It has a lot many features as it comes with root access. If you are looking for productivity and gaming, then MEmu android emulator can be chosen. Remix OS Player is the new Android Emulator by Jade, and it comes with Marshmallow. It is straightforward to install and simple for productivity and gaming. It has a sidebar which helps you to customize the configurations. It does not support AMD Chipset. YouWave is another android emulator for Windows 8.1/10 PC. It has a lot of exciting features and is the best choice for Windows PC. It has got easy to use user interface and has gained popularity in a very short period. YouWave Android emulator works with all Windows versions. It supports Android 5.1 Lollipop and has SD Card functionality. It supports dynamic rotating and can play multi-player online games. Jar Of Beans is Android Jelly Beans Android emulator for Windows 8/10 PC. It has priority worldwide and easy to install. You can configure settings as you want and can also create a Virtual SD Card. You can download apk and connect them using jar Of Beans. If you are new to android emulators, then initially you need to get hands-on Official Emulator. It is from android officially and easy to install and use. It has a complete guide and documentation to make it easy to use, and you need to try it. Many Android Emulator is one of the best android emulators for Windows. It comes with in-browser support, and it supports all android versions. So, if you are an android app developer, then you can use this to test your Android app in all versions without leaving it. 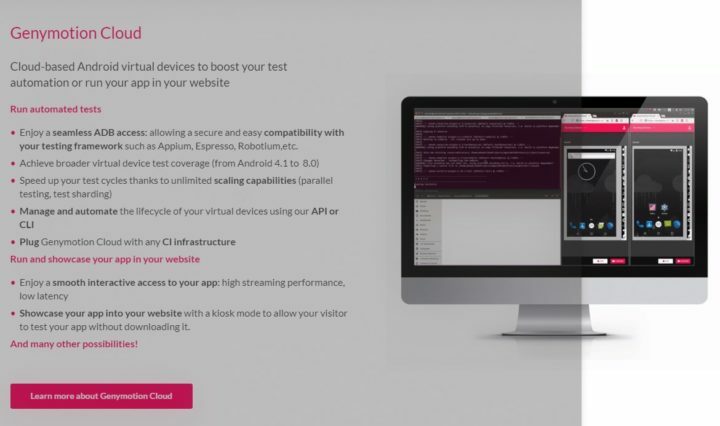 It is easy to download, install and test your applications. Xamarin Android Emulator is must needed android emulator if you want to work with visual studio as it comes built-in with this. It also has Xamarin studio and OpenGL support. It works with all versions of Windows and is said to be the lightweight android emulator. Android Emulators for Mac Free download. These are some of the best emulators for Mac & PC. If you have anything to add, please do let us know through comments.